Thomas Watson McCONNELL was born in Carlcuie Cottage on 8 October 1888 to gamekeeper John McCONNELL and his wife Isabella WATSON. As the second son born to John and Isabella, his name was taken from that of his mother’s father Thomas WATSON. In the 1891 census, Thomas, 4 was still too young for school. 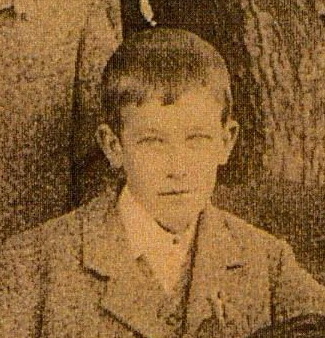 Photo left: Thomas, summer of 1895 [see post 16 April 2013 for family group photo]. Photo is from the collection of Mary Smith (in Tennessee). May Wood in Ayrshire, Scotland also has a copy of this photograph. This is the only known photograph of Thomas; hopefully others will come to light. By 1901, Thomas now 14, had become ‘clerk’, although the type of clerk is not identified. He was 17 years old when his mother died, unexpectedly, on the 11 June 1904 in the Western Infirmary Glasgow after an unsuccessful operation. The suddenly motherless family of seven McConnell children had yet another worry – Thomas’ health. It is likely that by mid 1904 Thomas had begun to show signs of tuberculosis or consumption. He died of this disease, on 1 October 1905 – little more than a year after the death of his mother. His death occurred at Byolu (sp?) Street in Ayr; at the time of his death he worked as a ‘railway clerk’ and he had been sick ‘some months’. His elder brother John was the informant of his death, it is easy to imagine that his grief strickened father, still mourning the death of his wife, did not feel up to the task. It is not known why Thomas died in Ayr, and not at Carcluie Cottage where he had lived with his parents and siblings for many years. Perhaps his father had left Carcluie Cottage, no longer worked as a gamekeeper and now lived in Ayr? Hopefully answers to this question will be found in the future.